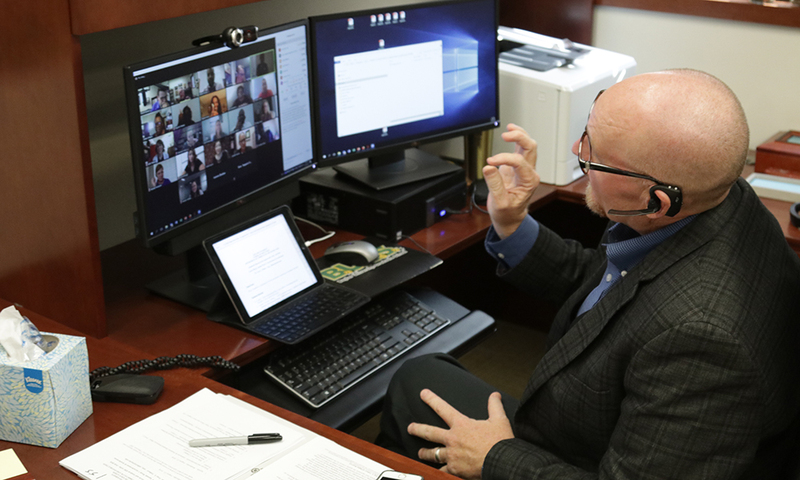 When the faculty in the Department of Curriculum & Instruction voted to redesign the EdD program and offer it in an online format, they planned to start out slowly with a small cohort. That didn't quite work out. The response to the new Online EdD in Learning and Organizational Change was overwhelmingly positive, and the inaugural cohort that started in August numbers 51 students. More than 4,500 prospects submitted an online inquiry into the program, representing 47 states. "We took the opportunity of moving online to really reconceptualize our EdD program,&rdquo; said Dr. Sandi Cooper, professor and director of the program. "It's a true EdD now; it's designed for those who are full-time working professionals." In addition to online courses, students will have two &ldquo;immersion&rdquo; experiences when the entire cohort spends time together on the Baylor campus. The first immersion is planned for summer 2019. 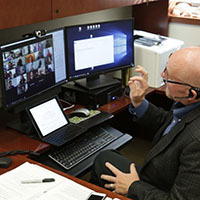 The Baylor EdD Online is offered in partnership with 2U Inc., a global leader in education technology that partners with top colleges and universities. 2U provides the technology platform, student support services, marketing and analytics, while the University and SOE faculty in C&;I maintain responsibility and control for all academic functions — admissions decisions, teaching, guiding students&rsquo; research work, and any other academic-related matters. Cohort One students are taking two courses this fall, with Dr. Tony Talbert (pictured, above) and Dr. Brooke Blevins as inaugural professors. There are live online class sessions each week on a specific day and time. The professors recorded lectures earlier this year, which the students watch on their own schedule for the asynchronous sessions each week. "The 2U platform is a holistic, well-planned approach, and it gives the students a true Baylor experience,"; Blevins said. "Frankly, I was nervous about teaching 'Issues in Diversity'&rsquo;' online, because it's a discussion-heavy course, and the students lead a lot of conversations. The 2U course development specialist worked with me to come up with technological solutions and trained me to use them, so I'm able to create the same culture that we have when we're in the same physical space." Talbert said he had the butterflies of a first-year teacher as class launched this fall. "But then I heard the students getting acquainted and talking about their pride in being selected as the first cohort of a highly selective and rigorous program, and the butterflies took flight," he said. "Whether the technology is a piece of white chalk on a blackboard or a computer cursor scrolling across a monitor, the common denominator across the centuries is that teaching and learning are communal endeavors. In this program, we've been able to create a powerful symbiotic relationship integrated through content, context, strategy and serendipity."